How you use Attendance within MINTclass depends on how your school Timetable is set up. If you have Registration Periods in MINTclass, then please follow the instructions marked A. If you do not have Registration Periods set up, then you will need to create your form/tutor group (click here for more information) and follow instructions marked B. 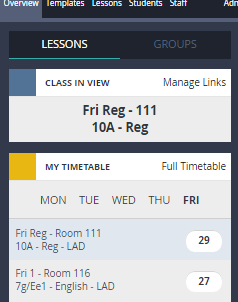 When you log into MINTclass, you will see your registration as a period on your timetable on the left-hand side of the screen. Select the registration group that you wish to take the attendance for and then click on the Take Attendance button in the sidebar. You will see that by default, all students are presumed present so you only have to mark the absent or late students. 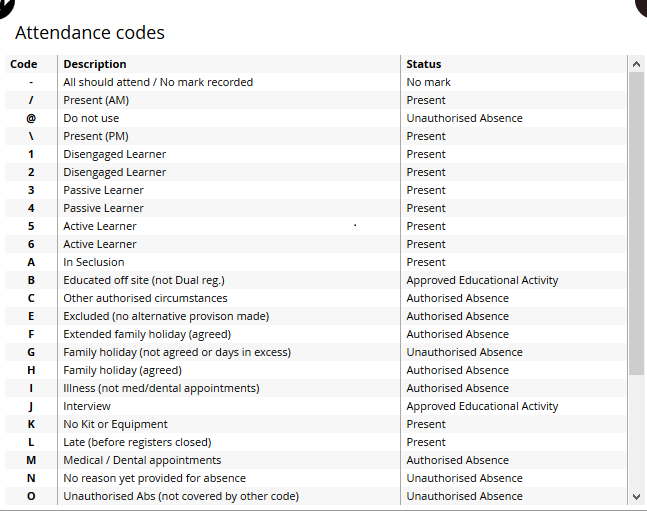 We have added the most popular reasons on each student card to make selecting absence codes easier. 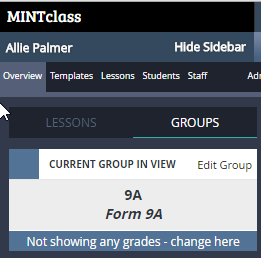 When you log into MINTclass, you will need to select your Form Group. If you haven't created Form Groups, please click here for more information. 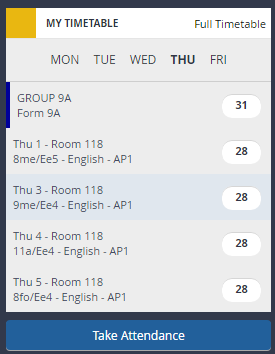 Click on the Groups button in the top right-hand corner of the Class In View area on the sidebar and then select your Form Group. You will now see your Form Group seating plan as if it were a normal lesson. On the sidebar, click on the Take Attendance button. 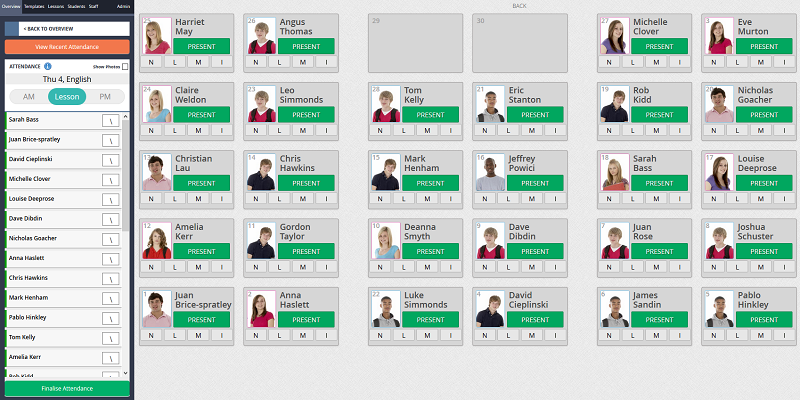 To mark a student absent using the cards 'quick picks', just click on the appropriate icon. For example, 'L' for late. However, these may vary per school. By doing this you will notice that the present icon has now gone grey and the reason you have chosen has gone red. You can amend these as many times as you like before you finalise the attendance. If the reason for absence is not on the cards, you can use the sidebar list. 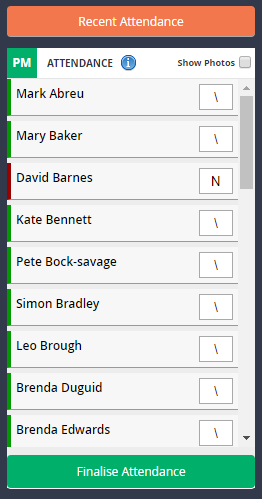 On the sidebar next to each student's name, you will see a box. By default, these will be marked as present. To change the codes, simply overtype with the code that you wish to use. To see a full list of codes, click on the Information button at the top of the list. Once you have entered the attendance marks that you need, whether that is by using the quick picks or the sidebar, click on Finalise Attendance. You will now have a chance to modify any codes if needed and add information such as the number of minutes a student was late and any notes you may have. Once you are sure the attendance is correct, click on the Officially Record Attendance button at the bottom of the screen. This will now send your attendance back in SIMS straight away. Note: by submitting the data, you understand that this is an official recording and you should be the teacher responsible for attendance. 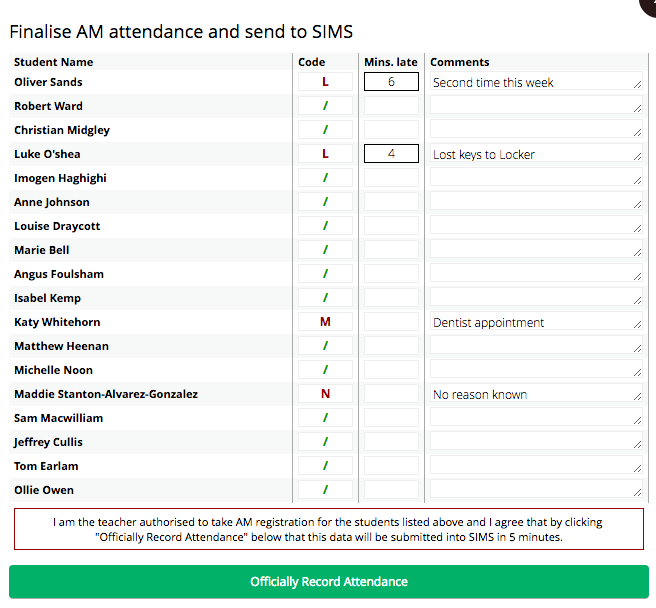 You can send the attendance as many times as you like throughout a lesson by clicking on the Take Attendance button. If you have already taken the attendance, you will be asked whether you want to take it again or load previous marks.